Kraftwerks first ‘concept’ LP. A classic. The title track was drastically edited and become a number 25 in the US Billboard charts. In Europe Autobahn reached even higher with it getting to number 11 in the UK. Commercial success had arrived for Kraftwerk. Between late 1973 and 1974 the group made a quantum leap in the way that they created and produced music. And this is the first step in a later sequence of moves that would transform popular music from the underground up. Ralf Hutter acknowledges the impact that Karlheinz Stockhausen had on him but Autobahn remains one of the rare examples of music that does not appear to have any forerunners. Autobahn instead initiates many influences that are still going today. Over the next decade and more Kraftwerk would touch the work of many artists as diverse as David Bowie, Afrika Bambaataa, Depech Mode and Juan Atkin. 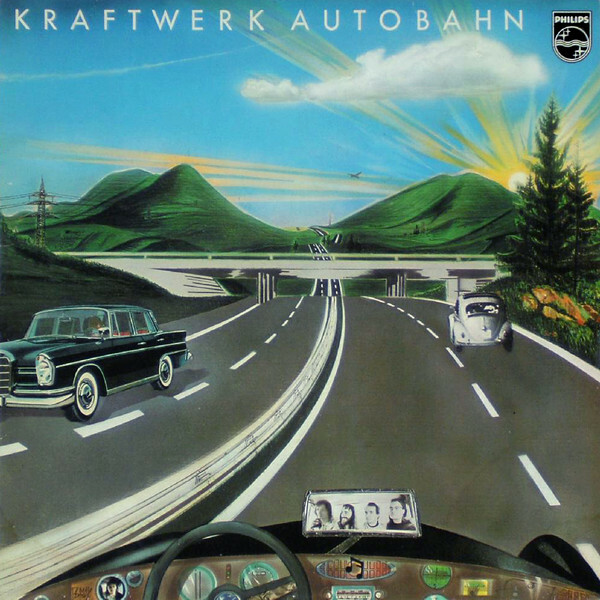 Autobahn is not a entirely made with electronic instruments. Violin, guitar and piano all make an appearance. The title track features both natural and electronically altered voice. Kraftwerk also used various devices of the own design and manufacture, such as the famous electronic drum kit. When first heard many people thought that the central line was “fun, fun. fun on the Autobahn”, which seems a deliberate echo of the “fun, fun, fun” that the Beach Boys sang. But the words are actually “Wir fahr’n, fahr’n, fahr’n auf der autbahn”. IN an interview with Lister Bangs in 1975, the group admitted that they were intrigued and perhaps even influenced by the “psychological structures” constructed and used by the American group. 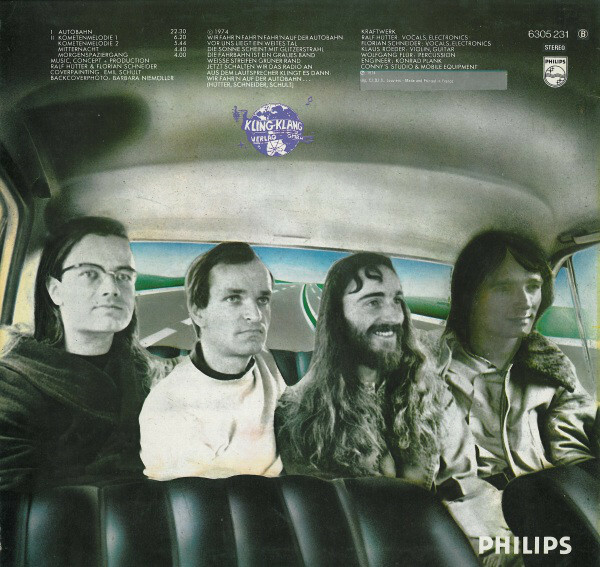 The global success of Autobahn allowed the band to bring their production in-house to their Kling Klang studio in Dusseldorf. Where today it remains their very secretive HQ.